It has taken me several days to recover from the digestive excesses of Thanksgiving. I went to the store yesterday to buy milk and turned a little green when I saw the cream lurking on the shelf nearby. So I have vowed to work on simple foods–salads in particular–to get my palate and waist back into line before the latkes and Christmas cookies start flying around. The trouble with this strategy is that there are still plenty of leftovers from Thanksgiving in the house. I don’t have any trouble avoiding the desserts (most of them are in the freezer at this point anyway), but I can’t really ignore the turkey. 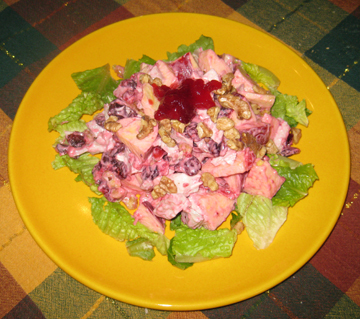 A couple of days ago I decided to throw some turkey and cranberry sauce into a Waldorf Salad. I love Waldorf Salads. Actually, I love the Waldorf-Astoria Hotel, period–the chic art-deco trim, the Bauman rare-book display in the lobby, Cole Porter’s piano (surely the classiest musical instrument in the world! ), the charming waiters and receptionists. Ever since then I have dreamed of calling my autobiography I Sang at the Waldorf. I also like the Waldorf’s long culinary history, particularly the legend of maître d’hôtel Oscar Tschirky, who worked at the hotel from its opening in 1893 until 1943. Oscar of the Waldorf, as he was called (perhaps I should rename my book Tinky of the Waldorf?) created the Waldorf Salad, Veal Oscar, and (according to some sources) Eggs Benedict. He also introduced Thousand-Island Dressing to a wider eatership. He was known for his flair with food and with people. When asked for a testimonial to accompany his application at the Waldorf, he allegedly walked around Delmonico’s Restaurant (his previous workplace) asking his favorite customers to sign the glowing letter of recommendation he himself had written. 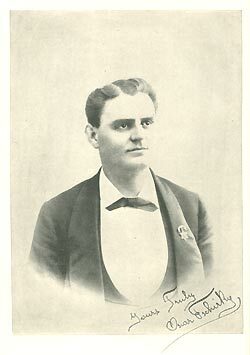 The signatures–supposedly from such luminaries as entertainer Lillian Russell, businessman/gourmand Diamond Jim Brady, and railroad executive George Jay Gould–did the trick, and Oscar Tschirky became Oscar of the Waldorf. The profile appeared in a book by Edward Hungerford (published by G.P. Putnam’s Sons) titled The Story of the Waldorf-Astoria. (The first edition was published in 1925; I don’t know whether the 1931 edition was identical or not.) You may read more of the profile and the book on either of these wonderful web sites: Old and Sold and Boldt Castle. Oscar believed in the craft of menu construction and amassed an extensive menu collection, which he left to Cornell University’s School of Hotel Administration along with his personal papers. I could write a lot more about Oscar and David and the Waldorf, but this essay has already meandered on longer than a blog post is supposed to. So let me return to the topic of my turkey–or rather Tschirky–salad. A Waldorf Salad has many virtues. It’s a cinch to throw together. It uses fresh ingredients one has on hand for much of the year. And it illustrates some of the properties that make those ingredients so wonderful. 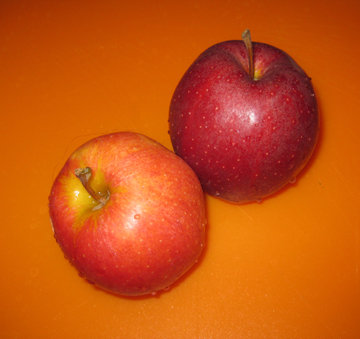 Apples, celery, and walnuts are crunchy foods. It’s only when eating them together in a salad, however, that one realizes that they’re crunchy in different but complementary ways. My Thanksgiving salad (also a great idea for Christmas!) adds the softness of turkey and the rich red hue of cranberry sauce to this classic dish. I have to admit that the color of the mixture startled me a bit. It’s a very mid-20th century shade of pink. I’ve always been one to embrace garishness, however. Oscar of the Waldorf had a flamboyant side. Why shouldn’t I? You’re the top. You’re a Waldorf salad. You’re the top. You’re a Berlin ballad…….. In a bowl combine the mayonnaise, the 2 tablespoons cranberry sauce, the salt, and half of the lemon juice. Sprinkle the rest of the lemon juice on the apple pieces and toss gently. In a larger bowl combine the apple pieces, most of the nuts (save out just a tablespoon or so), the celery, the cranberries, and the turkey. Add the mayonnaise mixture and stir until everything is a bit pink. Line a serving plate or bowl with a bed of lettuce, and place the salad on top. Sprinkle the remaining nuts on the top, and put just a dab of additional cranberry sauce smack in the middle (because you need EVEN MORE COLOR!). This entry was posted on Thursday, December 3rd, 2009 at 4:00 am	and is filed under Apples and Cider, Cranberries, Holiday Foods, Meat and Poultry, Salads and Dressings. You can follow any responses to this entry through the RSS 2.0 feed. You can leave a response, or trackback from your own site. I like being Toscar! As long as I don’t have to jump to my death at the end of the opera/meal. I loved the Oscar piece. I think Tinky of Singing Brook Farm has its own gravitas as well. The cranberrified Waldorf salad would be a very delightful course for a late spring or summer luncheon. It’s pretty, pink and has a nice tart coolness that might be quite refreshing on a hot day. I’m not a fan of pink, but looking at the color and considering the flavors, it could be fortified with shrimp and make a fine warm weather main course. We have a relative who adores anything curried – not the authentic Indian sort, but the curry along the lines of something tinged with the one-size-fits-all curry powder that one finds in any grocery store. She would love a dash of curry in the Waldorf-with-shrimp-with cranberry… Getting back to Mr. Waldorf and his salad, the cranberries and curry, I’m suddenly wondering if she’d think of the cranberries as acting like a chutney, which leads me to ask, “Have you invented a cranberry chutney recipe?” Somehow I suspect you have and I missed it. Final note: Oscar, Oscar, Oscar – and where’s the Academy Award salad? I DO have a cranberry chutney in my cookbook, although it’s not very chutney-like (not too spicy). I may just have to work on a new one! As for the Academy Awards, well, we’ll just have to wait until February.